Hi readers! Happy Saturday! 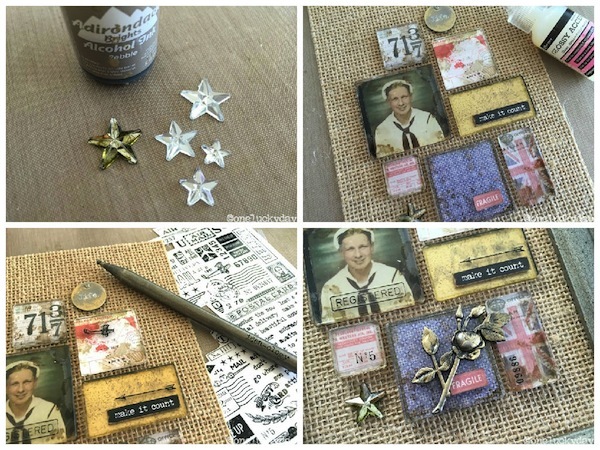 We’re very pleased to welcome back guest designer Paula Cheney to share a fun and unique project with us that features lots of fun goodies from Tim Holtz! Hi everyone! I’m glad to be back at Simon Says Stamp today to share another idea-ology project with you. Today’s project is all about Fragments. What are Fragments you say? Well they are clear tiles used to create custom adornments by gluing to paper or inking. 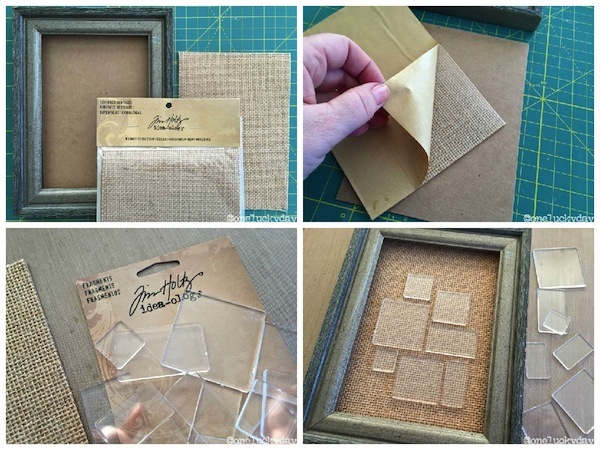 Follow along while I’ll show you how to use Fragments in a small frame, as well as some trick’s to giving your piece a vintage look. Come on, lets get started! I am using a frame I already had for this project – the opening is about 5 x 7”. My frame is kinda chunky, but really any shape or size will do, either adding or or subtracting Fragments until you are satisfied. I am also using the burlap from the Textured surfaces pack. This pack comes with 4 corrugate, 3 cork and 2 burlap. All are self-adhesive. I cut a piece of chipboard to fit the frame and adhered the burlap to the surface. The burlap is thin and a nice weave. It makes for a really smooth surface over the chipboard. Time to break open the package of Fragments! The new Fragments pack comes with 34 pieces in 8 different shapes. You can make a lot of projects with just one pack! 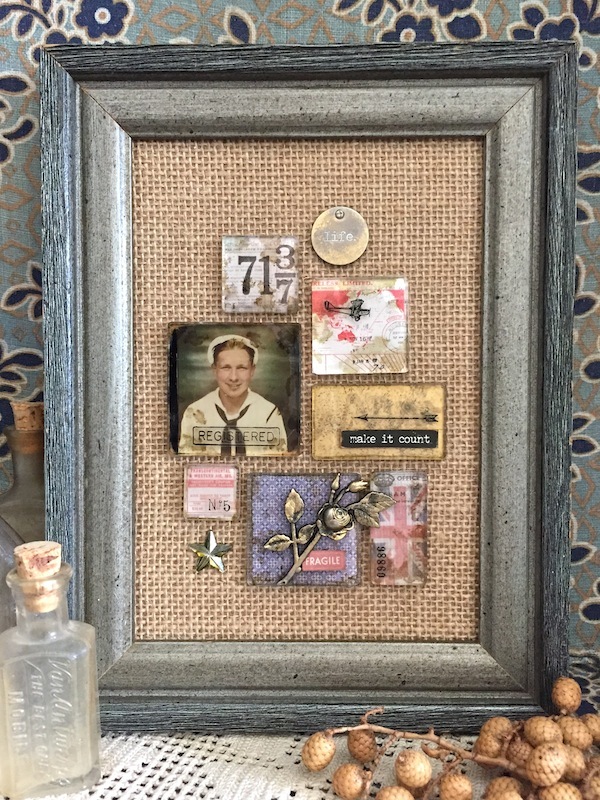 I placed my frame over the burlap to get the right placement for the Fragment pieces. I am using a page of 3 x 3” squares from the back of the Correspondence Paper Stash for this project. Using the miniaturized versions of the Correspondence paper is perfect for this project since the Fragments are small. Begin cutting paper to match each Fragment, leaving some blank for pictures and words. 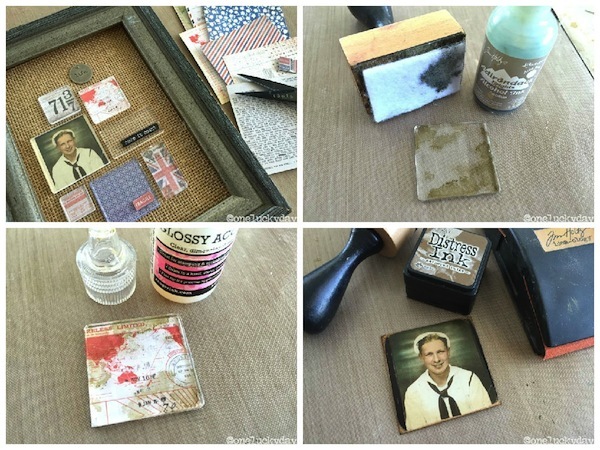 You can leave the Fragments clear or add Alcohol ink to create a vintage look. To do this, add a small amount of Alcohol Ink to the felt pad on the Blending Tool. Then pounce the tool onto the Fragment. HINT: It does not matter what side of the fragment you add the Alcohol ink to (there is no right or wrong side) but it does matter what side you place down on the surface. Alcohol Ink on bottom = darker, bolder look. Alcohol Ink on the top = lighter, more subtle vintage. Add glossy accents to the back of the Fragment. Adhere paper to the Fragment by moving the paper around in a circle to squeeze out any air bubbles. After a few seconds the paper will become adhered to the plastic and will become permanent. Trim off any paper from edges. The Photobooth picture was a bit narrower than the Fragment. I used a permanent marker to color the edges black, then sanded with the Sanding Grip and inked with Gathered Twigs to give it a vintage look. I added Gold Mixative (meaning you have to shake it up before use) to one of the blank Fragment pieces. When this is flipped over onto the burlap it will look like old mercury glass. I added a phrase from the Small Talk sticker book (one of my favorites of the new releases). So many phrases to choose from…and they come in black and white. It’s the perfect sticker book! Now for some small embellishments: Typed Tokens are small, lightweight word coins that have a hole at the top for hanging, or in this case, I added a Mini Fastener that will make it look like it is screwed in. I added white paint to the word, then wiped away the excess. Once dry, I added some gold Alcohol ink to the edges. I also added a bit of gold over the top of the rose from the Nature Adornments pack. Mirrored Stars are also fun to color with Alcohol Ink. One drop of Pebble is all you need to make the change from clear to vintage. Adhere all pieces to the burlap with Glossy Accents. Once the pieces are in place, add small Remnant Rubs to the Fragments using the Remnant Rub tool. This new metal stylus can be used to transfer and lift rub-ons to a surface. Works like a charm! The last thing to do is to add the metal rose over the Fragments at the bottom and add to the frame. I hope you enjoyed today’s project! The Fragment tiles are easy to work with and just a little bit addicting once you get started. So many idea-ology products could be added to a Fragment frame like Letterpress, Heirloom Roses and Adornment Arrows. The possibilities for personalization is endless…think wedding, birthday and graduation! Thanks for reading today, and thanks to Paula for being our guest! Paula = gorgeous art! Thanks for the inspiration. I have some fragments and will be making something similar today! Cool project. TH always has such interesting products to help the creativity flow! Great ideas for the fragments. Love the canvas! loved seeing all that can be done using alcohol inks and the clear fragment pieces !! Oh wow – I love seeing these used! Such a wonderful piece! Awesome project! Thanks for the process info! Nice project. I have some of those tiny fragments that I’ve never used! Paula’s projects are always fun to see! Haven’t used any of the Fragments but am very intrigued by this beautiful project! Great inspiration for what to do with fragments, gorgeous project frame! This is something totally different than I’ve seen before! Way cool! Wow, what a fabulous work of art! I just love this project idea! What a fun way to use up scraps and bits and pieces. This is AWESOME!!!! Beautiful…can just see some of my old photos on something like this. Thanks for the ideas!!!!! This is a lovely project and it seems like it wouldn’t take much time to make up. 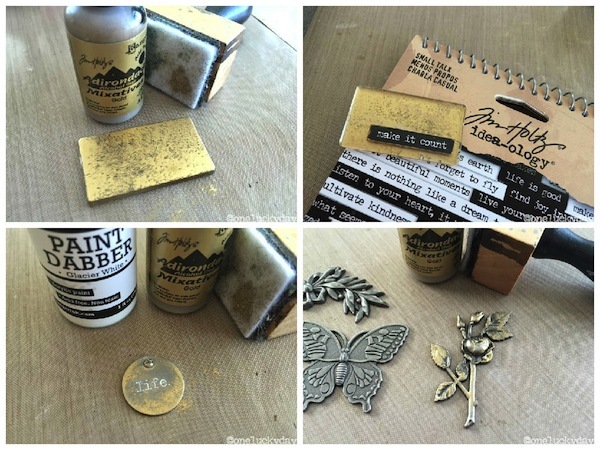 Tim Holtz products are the best so you know it will be great. Thanks for sharing your talent with us. Love the burlap backing-looks great with the fragments. I have a package of the fragments.. gotta try this! Oh my goodness Paula, your finished product is lovely. Looks like a fun project to try…TFS! This is a great gift idea. I love it! Love how this all comes together into such a great project! I can’t wait to get my hands on those new stickers. They rock my socks! Oh wow! What an awesome project. A friend of mine just gave me a brand new package of fragments because she wasn’t using them. Thanks for the inspiration on how I could use them! The fragments look amazing, I need to get myself some of those right away! Wow! Great project! Thanks for the great instructions too! I saw the Fragments packs and was wondering what to use them for… great inspiration! Thank you for this project and the instructions for making one of these! I may just make one of these or at least something similar for my mum with some photos of my brother, as we just lost him last Thursday. I loved it! You just gave me the perfect idea for a retirement gift :) Thanks! This is so cool. and its given me a couple of ideas. I have been wanting to do something dedicated to my husband and his brothers and this would work. Also it gives me an idea on what to do with all of my husbands old medals and pins from the army. This is a lovely idea for a way to showcase both photos and small 3-d memorabilia. Those little fragments make everything look like a treasure. O M G … I am so going to steal this idea … what a GREAT project!!! Such a crazy neat project!! Love the pic especially!!! What an amazing framed collage! Love the burlap…it really sets off the vintage pieces! Love the alcohol inks and fragments!